EVA FERNANDEZ has drawn upon colonial history to present times in creating the photographic works in A Rare Bird in the Lands . The title of the exhibition is inspired by a proverb by Roman satirist Juvenal, written in AD 82, which states, "rara avis in terris nigroque simillima cygno", and translates as, "a rare bird in the lands and very like a black swan". This became a popular metaphor for something impossible. We can thus imagine the surprise felt by early explorers when they discovered real black swans in Western Australia. As Jo Darbyshire writes in her catalogue essay that accompanies this exhibition, "When Western Australia was first visited by Dutch men the black swan (Cygnus atratus) was something to marvel over, as only white swans were seen in Europe and the black swan existed only in their imagination… This developed as 'the black swan theory', a metaphor that describes an event that comes as a surprise, has a major effect, and is often inappropriately rationalised after the fact with the benefit of hindsight." The black swan became the official state emblem of Western Australia, and is featured in the middle of the official coat of arms. Fernandez repositions the swan, and other emblematic flora and fauna representative of Western Australian identity, as trenchant symbols, to explore dark undertones of the state's brutal history; first contact of Europeans with the Whadjuk people and the impact of harsh colonial rule and dispossession of traditional lands. 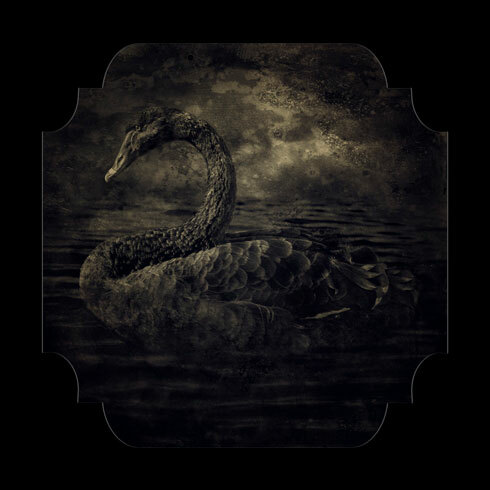 Throughout European history, literature, music and theatre, the black swan has been attributed with dark symbolism, having a sinister and seductive association with evil. Once static and innocent kangaroos, swans, ravens and flora become threatening, intimidating and hostile. These dark images are manipulated by Fernandez to appear as old Daguerreotypes, the photographic process which was popular during the early years of settlement of the Swan River Colony. Eva Fernandez was born Toronto, Canada, and lives and works in Perth, Western Australia. She completed a Master of Creative Arts at Edith Cowan University in 2002, and has been a practising artist for over two decades, working across digital based media and installation. Fernandez's practice is concerned with the investigation of the space in which she inhabits, exploring its complex history and the cultural legacy of colonialism and imperialism. Her work also explores her own cultural dislocation, as she negotiates pluralistic identity in context to contemporary issues of global displacement. Her works are included in numerous institutional and private collections including the Art Gallery of WA, the Janet Holmes a Court Collection, City of Perth, Murdoch University, Edith Cowan University, and several other hospital and local council collections. website © 2000-2019 TURNER GALLERIES. all images are © the artists and are not to be used without permission. exhibition pages are archival records and as such, prices are valid for the year of exhibition only. please contact the gallery or check the available works page to confirm current prices and availability.